Mouse Dkk-3, His Tag (DK3-M5226) is expressed from human 293 cells (HEK293). It contains AA Pro 23 - Ile 349 (Accession # NP_056629.1). The protein has a calculated MW of 37.1 kDa. 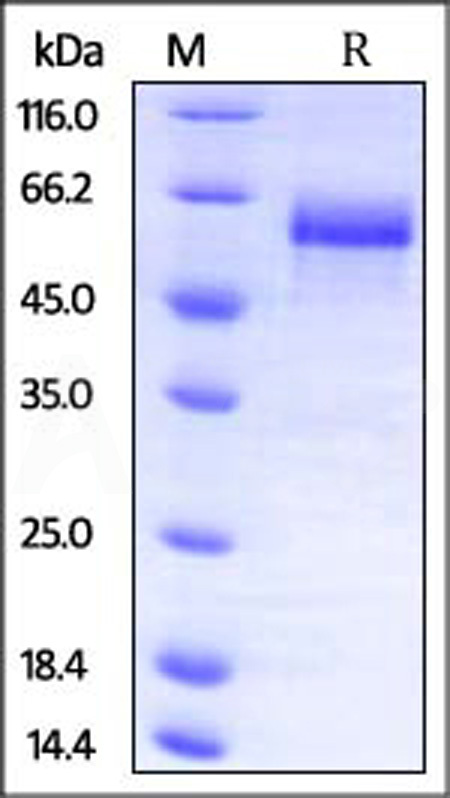 The protein migrates as 55-66 kDa under reducing (R) condition (SDS-PAGE) due to glycosylation. Mouse Dkk-3, His Tag on SDS-PAGE under reducing (R) condition. The gel was stained overnight with Coomassie Blue. The purity of the protein is greater than 95%. Members of the dickkopf-related protein family (DKK-1, -2, -3, and -4) are secreted proteins with two cysteine-rich domains separated by a linker region. And DKK3 has been proposed as tumour suppressor gene and a marker for tumour blood vessels. DKK3 is the only DKK family member abundantly expressed in normal lung, but silenced by promoter hypermethylation in a large fraction of lung cancer cell lines and lung tumors. Downregulation of DKK3 was correlated with tumor progression and expression of nuclear beta-catenin in lung tumors. Ectopic expression of DKK3 in lung cancer cells with DKK3 hypermethylation induced apoptosis and inhibited TCF-4 activity as well as nuclear accumulation of beta-catenin and expression of TCF-4 targets c-Myc and cyclin D1. DKK3 modulates FGF and Activin/Nodal signaling to regulate mesoderm induction during early Xenopus development, was reported. (1) Medinger M, Tzankov A,et al., 2011, Thromb Haemost. 105(1):72-80. (2) Yue W, Sun Q, et al., 2008, Carcinogenesis. 29(1):84-92..
(3) Pinho S, Niehrs C.et al., 2007, Differentiation. 75(10):957-67.